Of the many paintings that hung at Halswell during the 900 years of Halswell/Kemeys-Tynte family possession, it is the portraits that are of the most significance. Many of these, including a portrait by William Hogarth of Sir Charles Kemeys-Tynte, are now in the Pennington-Mellor-Munthe Collection at Southside House in Wimbledon, London. The Hogarth is particularly interesting as Sir Charles is posed as a garden designer with the Bath Stone Bridge in Mill Wood painted in the distance, still under scaffolding with masons carving and fixing stone. Sir Charles himself has a book titled Garden Plans at his side. The implication is that the sitter is not just a knight of the county but an active renaissance man of the Age of Enlightenment, bringing the newest forms of natural thinking to what was once a formal and rigid garden landscape. Generations earlier his forebears posed with the attributes of their military power that granted such local prestige to the family. But for Sir Charles art through architecture and nature were the attributes he wished to display to the world. 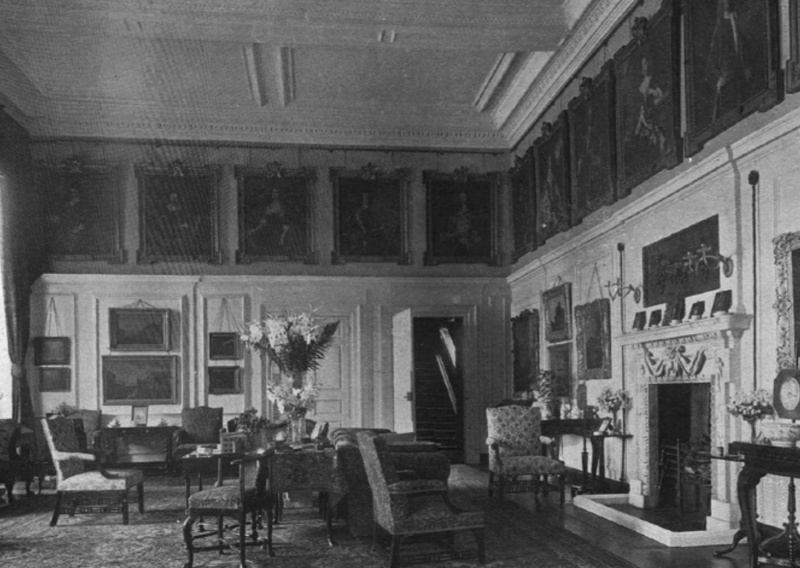 The Saloon at Halswell has a large open frieze above the wall panelling in which used to hang 21 family portraits, this collection of pictures still exists in full at Southside, though dispersed throughout the house itself. 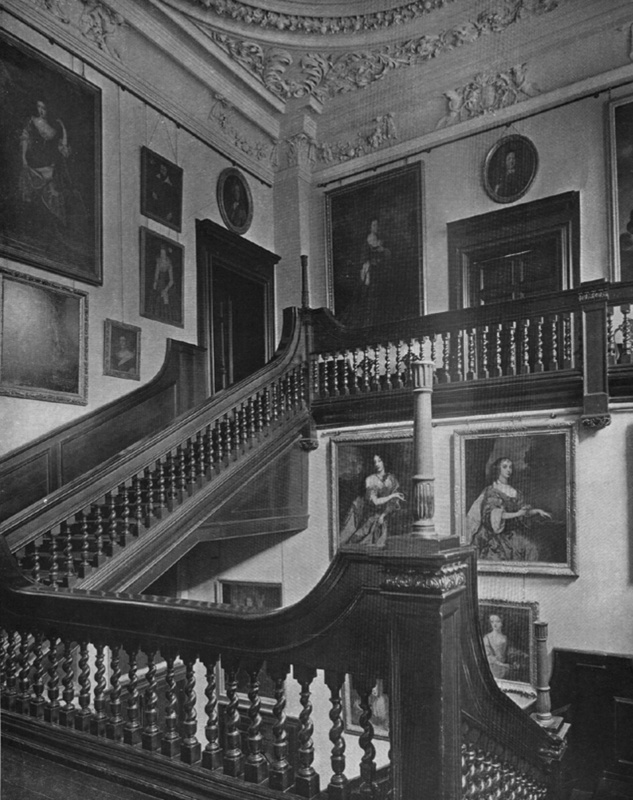 Country Life 1908, the Staircase. There is a more famous collection of portraits that bears the title Wharton, the Barony that a later Charles Kemeys-Tynte (1876 – 1934) had revived in his name in 1916, the Kemeys-Tyntes becoming the Lords Wharton from that date. It was deemed by parliament that the title had been left in abeyance, rather than become extinct, when all the Duke of Wharton’s titles were revoked in 1729 upon that Duke being declared a treasonous outlaw. Charles Kemeys-Tynte argued that the title of Baron Wharton could pass through the female line and thus had descended to him, as a direct heir through a female line from the Duke’s family. 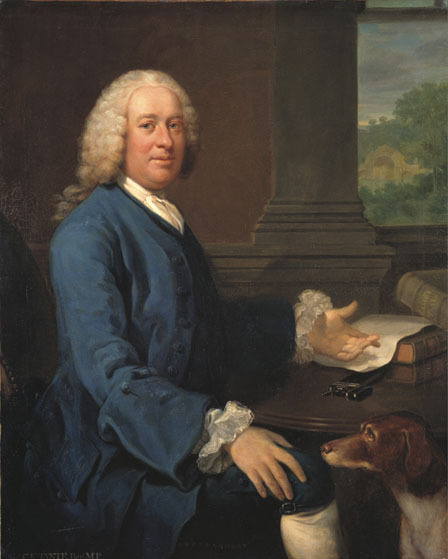 The connection between Charles Kemeys-Tynte, the 8th Baron Wharton, and his eighteenth century relation, The 1st, and last, Duke and 6th Baron Wharton did not however result in any of the Duke’s famous art collection descending to the 8th Baron. This important collection had been sold before the spendthrift Duke’s death in 1731, mainly to Robert Walpole. However Oliver Millar’s scholarly essay for the Burlington magazine brings them back together in this attached article.